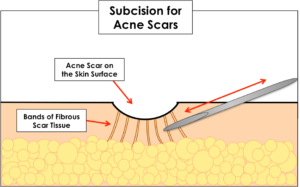 Without a doubt, acne scars are an unwelcome frustration for so many people. Usually, acne scar treatment is not considered medically necessary and is not covered by health insurance. However, the good news is that the appearance of your acne scars can be dramatically improved. Although acne scars can be very difficult to treat, we offer a wide range of treatments for any skin type. At your consultation appointment, our team will help you identify the best options and provide you with detailed treatment information. Often, we recommend a combination of several of the treatment options below for both faster & better results. Rolling scars are generally shallow, spread over a larger area (such as the cheeks), and characterized by their smooth, rounded edges. They’re also the easiest type to treat. Boxcar scars are deeper than rolling scars, typically confined to smaller areas, (such as the temples) and are characterized by their more defined borders. Ice pick scars are the most difficult type to treat. 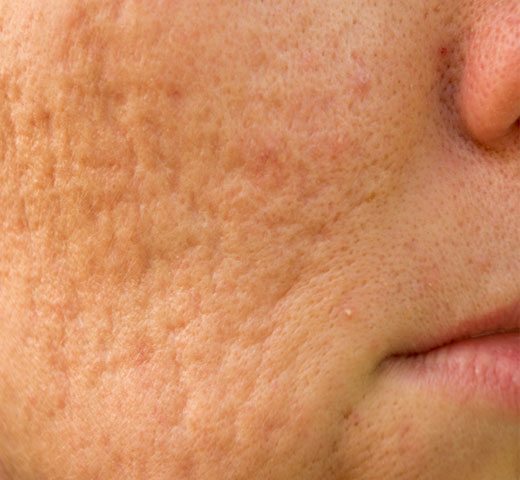 They’re often randomly dispersed and found in conjunction with other types of acne scars. They’re characterized by their narrow width and increased depth. Post-inflammatory hyperpigmentation is a flat, dark spot on the skin that remains long after the acne lesion has healed. Post-inflammatory erythema is a flat, red or pink spot on the skin that remains after the acne lesion has healed. Laser and light devices are used to improve the appearance of acne scars in a variety of ways. For example, CO2 & Erbium lasers work on dimishing the raised edges & contours of acne scars. In contrast, pulsed-dye, Q-switched and intense pulsed light devices are used for fading residual redness left behind by acne breakouts. You can read more about all of the the different lasers and lights we use for acne scars by selecting from the list below. Radio frequency is a treatment application that has proven to be highly effective for acne scars. These devices work by boosting the production of collagen & elastin in the dermis skin layer. As a result, the uneven texture caused by acne scarring is softened and the depth of the scars is reduced. Since these devices target & deliver energy below the epidermis, they are safe for all skin types and the risk for hyperpigmentation (dark spots) after treatment is very low. You can read more about all of the the different radio frequency treatments we use for acne scars by selecting from the list below. Many of the options in this section are utilized as part of a combination approach to treating acne scars, which can both expedite & enhance your results. 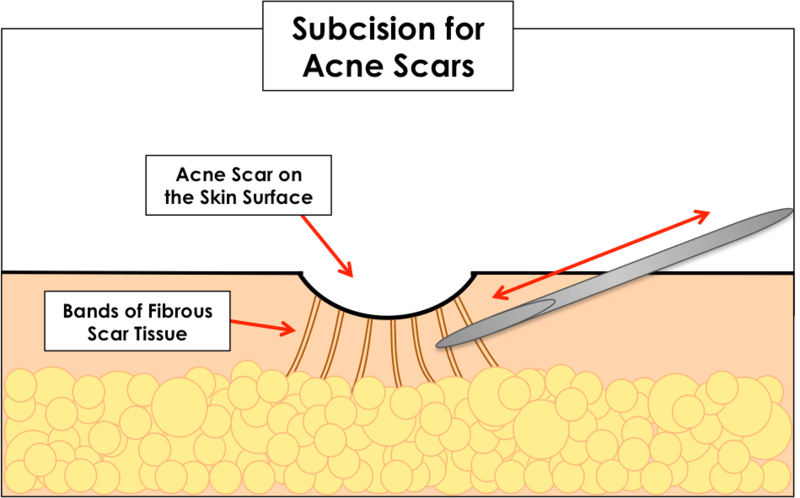 Subcision: A blunt needle is inserted just below the scar and moved back & forth to break up fibrous tissue bands that tether the acne scar and pull it down. By releasing these bands, the depression or “divot” you see on the surface of the skin is allowed to rise back up.